Brown meat in a large skillet over medium-high heat (350 degrees in an electric skillet). Drain fat. Add onion and peppers and cook for 8 to 10 minutes until vegetables are soft. Add rice, tomato, 2 cups water, and spices. Mix well and bring to a boil. Reduce heat to medium low, cover and simmer for 20 minutes. Add more water if needed. Sprinkle with cheese and serve. Try brown rice and simmer for 10 more minutes. If using instant rice, reduce water to 1 cup. 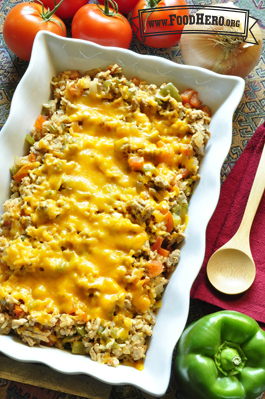 Try ground turkey in place of beef.